Lower Susquehanna Archaeological Society, Chapter 28, of the Society of Pennsylvania Archaeology (S.P.A.) is a non-profit organization which promotes the advancement of archaeological investigations and preservation of both historic and prehistoric materials. Public education and celebrations of various cultures both past and present are achieved by lectures, special events and hands on workshops offered to anyone interested in local archaeology or history. Our chapter emphasizes the importance of cataloging and recording artifacts of excavated sites and helping others document their collections. 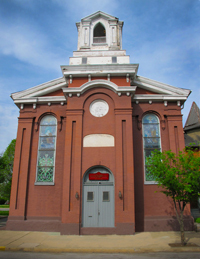 Our chapter meets the 3rd Sunday of every other month at the Columbia Historic Preservation Society’s Banner Hall 21 North 2nd Street, Columbia, Pennsylvania 17512. Always call or email the above contacts to confirm meeting times because the schedule may vary throughout the year. Sept. 2016 Chapter 28 members assembled to excavate a privy on the property of Friends Meeting House in York. The historical background of the property proved to be very exciting and many historical artifacts were uncovered. The York Meeting House is a historic Quaker house located at 134 West Philadelphia Street in York, PA. It was built in 1766 and expanded in 1783. The original building was a two-bay brick structure with a gable roof. Many artifacts ranging from glassware, old bottles, ceramics, bricks, old leather shoes, buttons, nails, etc. These items will be returned to the Meeting house ( once cleaned and cataloged) to be placed on display.